Do you want the ability to fully customize your bed to your ideal comfort positions? Well, you’re in luck, because today we’re testing Purple’s first adjustable bed frame. The Purple Power Base is designed for fully customizable comfort plus many desirable extras. Does this adjustable bed have what it takes to win you over? Continue reading to find out! Don’t have enough time to read the full review? Click here to jump straight to the summary. The Purple Power Base is designed for fully customizable comfort plus many desirable extras. The Purple Power Base is constructed from an all-steel frame, four steel legs, and two motors (head and foot). The base itself sits at 7.5″ thick, while the legs can be adjusted to three different heights: 3″, 5.25″, or 8.25″. Therefore, the total height of the Purple Power Base can be 10.5″, 12.75″, or 15.75″, depending on your preferred leg height. Additionally, there are two “massage hubs” that are placed under the head and foot of the frame. Also known as the Royal Purple Massage, these massage hubs are powered by the two motors located at the head and foot of the mattress. 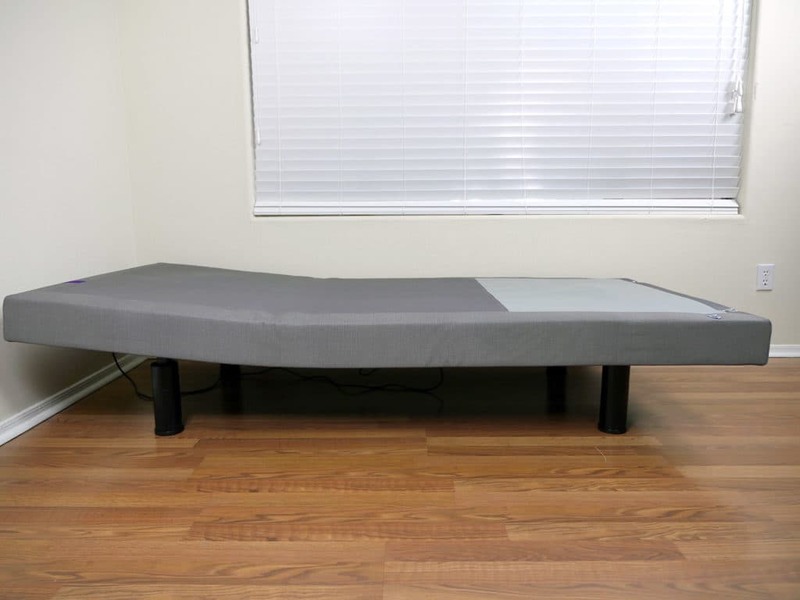 The cover of this adjustable bed is constructed from 100% polyester. The use of polyester helps create a breathable surface in addition to a tightly wrapped cover for the adjustable bed. 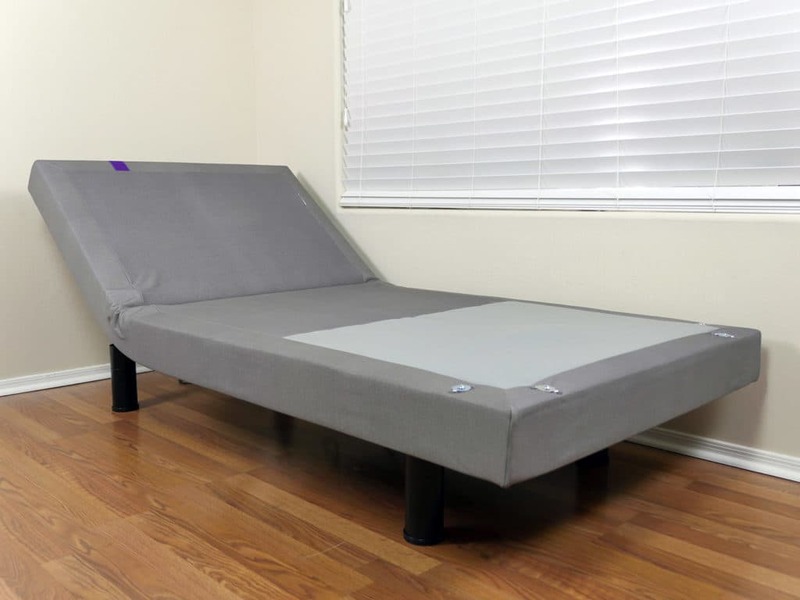 The interior portion of the side panels contains a layer of polyurethane foam to help prevent injuries when getting in and out of bed and / or walking around your bed in general. As an added feature, the Purple Power Base can also be placed inside of or on top of an existing bed frame by simply removing the legs and lying it flat on the current foundation. 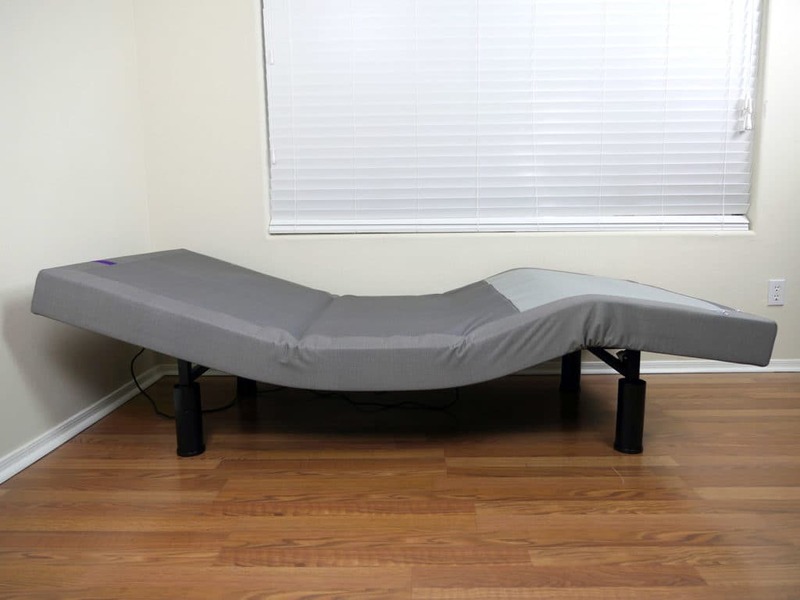 Assembling Purple’s adjustable bed was quick and easy. The Purple Power Base was delivered already assembled except for the legs. The only additional work that had to be done to the base was screwing in each of the four legs. Once the legs were screwed in, my cousin and I team lifted the Purple Power Base and placed it flat down on the legs. Purple recommends not leaning the weight of the base on the legs when trying to flip it over, hence the reason my cousin and I each grabbed an end of the base and flipped it over together. Purple also includes two optional mattress retainer bars that work to hold the mattress in place while the adjustable bed is moving (or adjusted to more extreme angles). These require a few additional minutes to put into place, but the process is also quite simple. There isn’t a headboard attachment included with the adjustable base, but one can be ordered through Purple’s customer service team. The Purple Power Base offers a high level of support all around. Both the mattress and the sleeper are well supported. That said, to benefit completely from this adjustable bed, you’ll want to sleep on primarily on your back (and perhaps your side). In general, adjustable beds are designed to help relieve pressure points, while placing the spine in a more ideally supported position. For this reason, back sleepers benefit the most. You can also find some less elevated positions that are suitable for side sleepers as well. However, there are virtually no positions that are suitable for stomach sleepers (unless that adjustable bed is completely flat). The Purple Power Base can support a combined weight of 850 pounds between the mattress and the sleeper(s). Extra features may not be the primary reason for purchasing an adjustable bed, but they don’t hurt either. 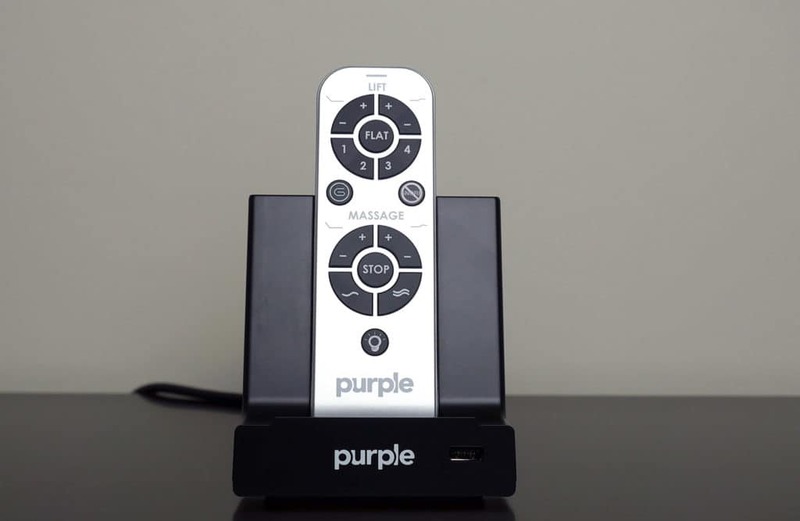 The Purple Power Base comes equipped with zero gravity sleep positioning, full-body frequency massage, head and foot incline, a one-touch remote settings, and more. To begin with, the adjustable base creates zero gravity sleep positioning. While in Zero-gravity, both the sleeper’s head and feet are raised. This position is designed to provide health benefits such as better blood flow, less stress on organs and muscles, and improved oxygenation. The bed base also offers an Anti-snore position. By clicking the Anti-snore button on the remote, the head of the Purple Power Base will move into an inclined position, designed to help stop or prevent snoring. In addition to these two positions, the adjustable bed offers four other positional variations (listed 1-4 on the remote). Each one of these positions will change the incline of the base in some shape or form. Depending on which number you choose, the base could adjust the head, the feet, or both. The remote also includes a “flat” button, which will return the Purple Power Base back to a completely flat position. With several features, the customizable programming is probably the most interesting. Buttons 1-4 on the remote already contain pre-set positions, but these can be easily changed. If a sleeper would like to change one, or all of these positions, they can manually lift the head and / or foot of the adjustable bed base and hold down their preferred number once they have reached their desired position. Once this action is complete, the Purple Power Base stores this position into its memory. Now, once the appropriate button is pressed, the bed will move into the pre-programmed position set by the sleeper. These positions can be changed in the future if the sleeper no longer enjoys the position currently associated with the button pressed. FAQ: Do you need a boxspring? Purple also added a massage feature to their base, known as frequency resonant massage. This feature is designed to provide sleepers with a full-body massage without vibrating the whole bed frame. The massage comes with multiple strength and pattern settings and can be changed by using the one-touch buttons featured on the wireless remote. 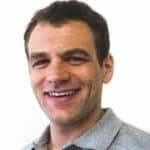 Additionally, the massage can be changed to focus on just the head or just the feet, as well as work its way up and down the body in a wave-like motion. A wireless remote comes included to operate every function offered the base. Designed with one-touch settings, your favorite positions can easily be reached by simply clicking the appropriate button on the remote. As an extra, Purple includes a small stand for the remote. This stand is able to hold your remote, but also serves as a charging source for your phone, laptop, and several other devices. One USB port is located on the front of the stand and two A/C ports are located on the back. One final feature offered by the Purple Power Base is the under-bed LED lighting. There is a light located underneath the bed frame, which allows sleepers to more easily see during the night. That said, the light is quite dull. When compared to other adjustable beds I have tested, Purple does have the dimmest light to date. This is a positive in a sense that the light will not wake up a partner, but it could be a negative with regards to actually seeing around the base. Some sleepers may prefer a bit more illumination around their bed frame. Should I buy the Purple Power Base? Want a more modern looking adjustable bed – The Purple Power Base’s sleek and straightforward design creates one of the more modern looking adjustable beds I have seen. Want customizable comfort – The Purple Power Base comes with the option to preset your favorite positions for one-touch ease. Through the wireless remote, you’re one touch away from features such as massage, zero gravity positioning, anti-snore positioning, or even your own pre-set positions. Want adjustable leg heights – The Purple Power Base offers varying leg heights. The sleeper has the ability to raise the legs to heights of 3”, 5.25”, or 8.25” off of the ground. These adjustable leg heights combine with the 7.5″ thickness of the base itself to give sleepers more options with respect to aesthetics and storage. 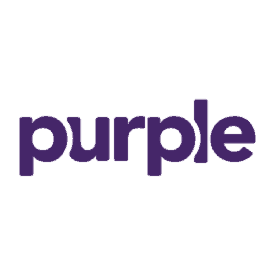 For more information on the Purple Power Base, visit OnPurple.com. 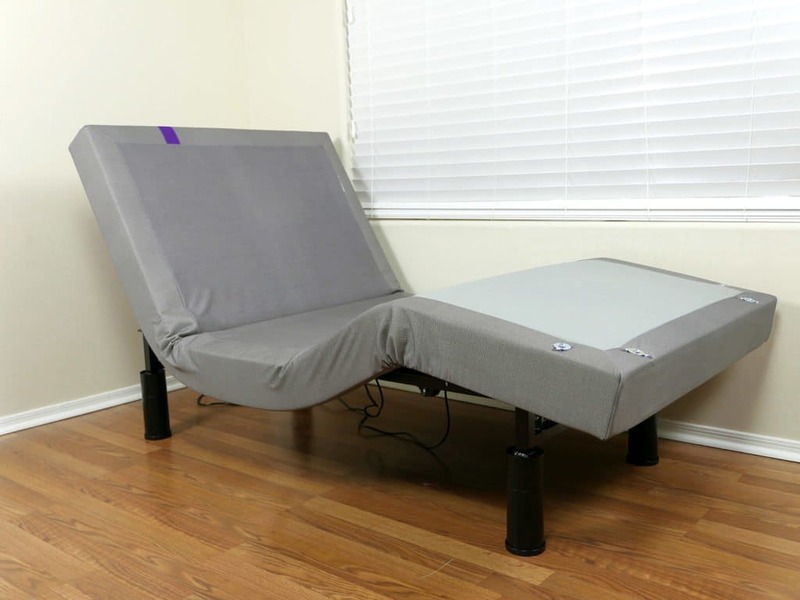 The Purple Power Base is a well-rounded, multi-functional, adjustable bed base built for the sleeper who is looking to get a little more out of their bed frame. With several features, including pre-programmed incline / decline, full body massage, and under-bed lighting, the Purple Power Base is able to meet the needs of a wide variety of sleepers. If you’re in the market for a new adjustable bed, but don’t know where to look, the Purple Power Base is a great option to consider.